The third stop on Just Up The Pike's "County Government Head-to-Head Tour." 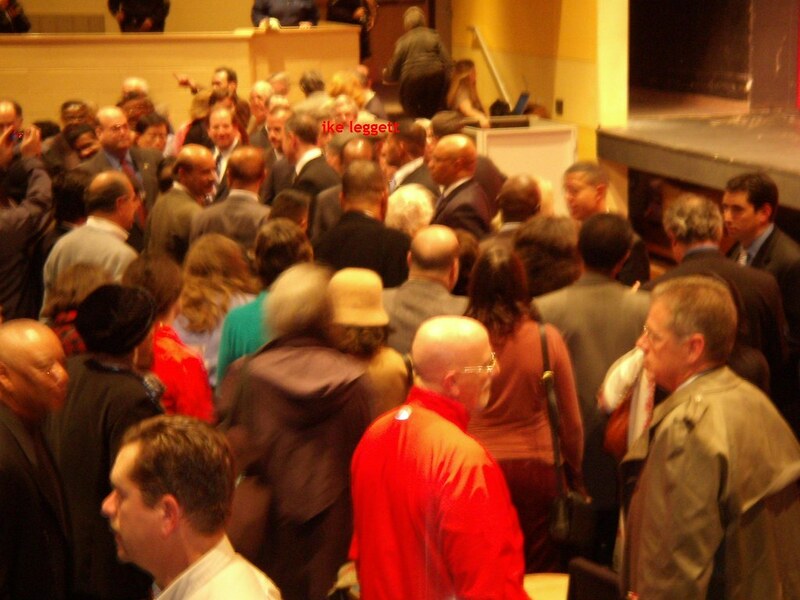 It's not surprising that Montgomery County Executive Ike Leggett looks incredibly tired even at busy events like last month's town hall meeting with Martin O'Malley. Yet for all his struggles, he's remained a very popular candidate. "I was one of the top vote-getters in Montgomery County for a long time," he explains. "If you look at every election over the past sixteen years . . . I was probably the person favored to win. At no point in time was [Steve Silverman] ever ahead." For the past several months, I've made a name for myself as an ardent Ike Leggett critic through a series of awkward but fiery exchanges. Like most of the County government, it seems, Leggett reads Just Up The Pike, and he wasn't happy with what he read. "All I ask is that you get my real opinion," he said. "If you want to write something and you need my opinion, e-mail me. Just make sure you get my real opinion." So these are Ike Leggett's real opinions, recorded at the Executive Office Building in Rockville and hopefully put forth in the most direct and honest manner possible. Ike Leggett speaks slowly and softly, like he would in front of a class at Howard. With one finger, he languidly fidgeted with the sugar packets surrounding his teacup, a delicate piece with a nature scene painted on it. "I don't believe that the impact of growth is so dominant," Leggett opines, pointing out that last week, Steve Silverman had said in the Post that he didn't think NeighborsPAC "created the mood" on development in the County. Over the past several years, Leggett says, "we shifted transportation needs, growth, the cost of schools . . . more of the burden on homeowners and taxpayers. The citizens actually reacted to that. What I've said and what others have said is that we need to correct that." He explains that, at build-out, Montgomery County should have another 200,000 people. At that rate, we could reach build-out in ten years. "I believe we should [grow that much], but the question is what pace of growth . . . We will have that growth," Leggett says. 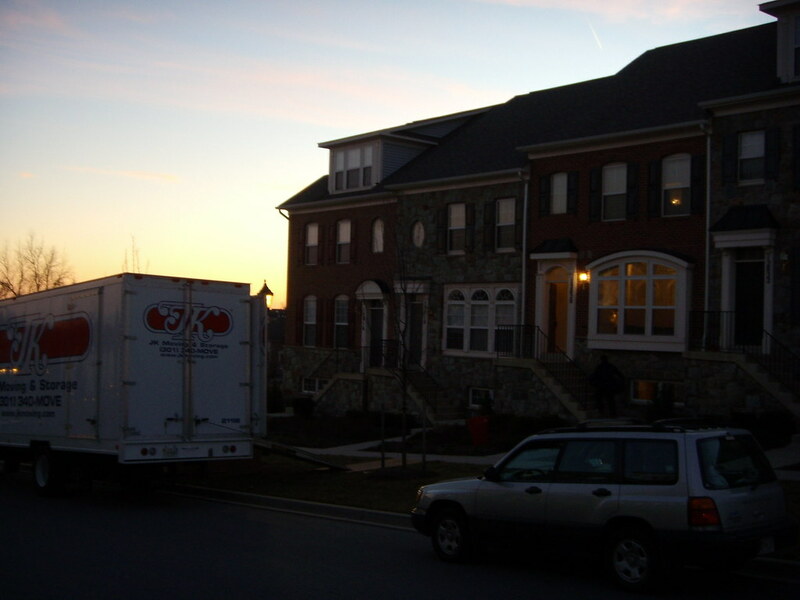 "It slowed down because of Clarksburg and because the economy slowed down." The moratorium was "never to totally stop growth," Leggett insists. "It was to pause, change the policy, and start again." 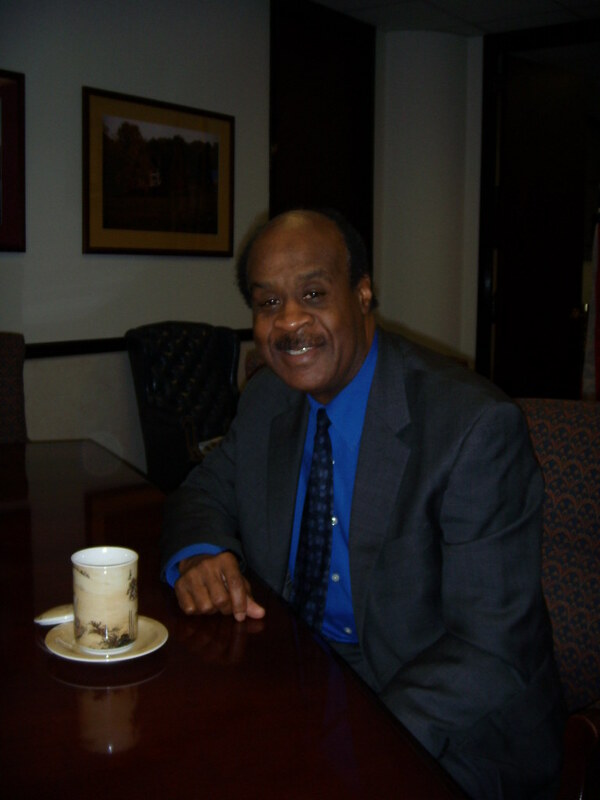 Ike Leggett predicts big things for the vast gravel fields of East Montgomery County. When asked about the need to correct the jobs-housing imbalance in East County by building more office space, the first thing Leggett mentions is Percontee, the gravel mine on Cherry Hill Road. Eventually, it could become a mixed-use development dubbed LifeSci Village, adding a "sense of community" found to be lacking in East County, according to its developers. It's a "very attractive area for jobs," Leggett says, "and there are a couple of other sites," mostly near Cherry Hill Road. He also mentions the Verizon campus at Route 29 and Musgrove Road as ripe for redevelopment. The east side of the campus, home to a 1960's-era building reminiscent of the historically-significant COMSAT building in Clarksburg, is currently underutilized. 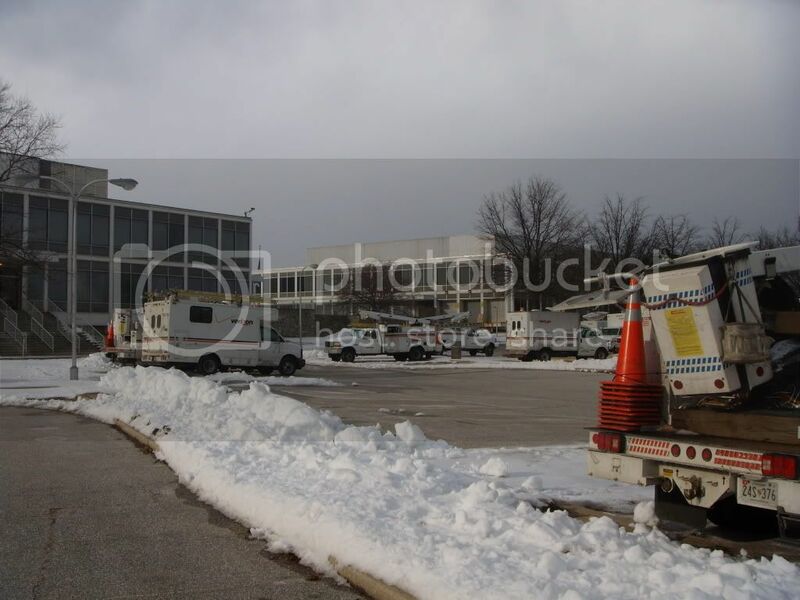 White service trucks sit idly in the parking lot, waiting to be dispatched. "The number of jobs are relatively small compared to the size of the building," he notes. Leggett appeared to support all of these future developments, but with some caution. "I think they as well as others need to go back and review the master plan," he says. "It has to be consistent." Consistency was less of a concern for Briggs Chaney, where several developments of half-million-dollar townhomes are steadily chipping away at the neighborhood's reputation for cheap garden apartments and drug deals. "We have a real need for some levels of affordable housing," he says, fearing that one day, those garden apartments might be redeveloped. "You also need to keep a healthy mix." Before I prepared to leave, Ike Leggett remembered one more thing: "You have a question on the Purple Line," he says. Finally, he's going to say something I've been waiting to hear for months. Seven years ago, Ike Leggett wrote an editorial to the Post saying that the Purple Line - then known as the Georgetown Branch and only running between Bethesda and Silver Spring - "will have severe financial and environmental costs," citing Baltimore's light-rail as an example of poor planning. Steve Silverman attempted to use this against him in last year's campaign, claiming that Ike Leggett was opposed to the Purple Line. Leggett says that it's more complicated than that. What Leggett opposed was the plan to put trains in both directions on the same track, so a train in Silver Spring would go to Bethesda, turn around, and go back. "It would have taken forty-three minutes with single-track and back," he says. "If you're on the platform in Silver Spring and the train just left, that's forty-three minutes you have to wait." 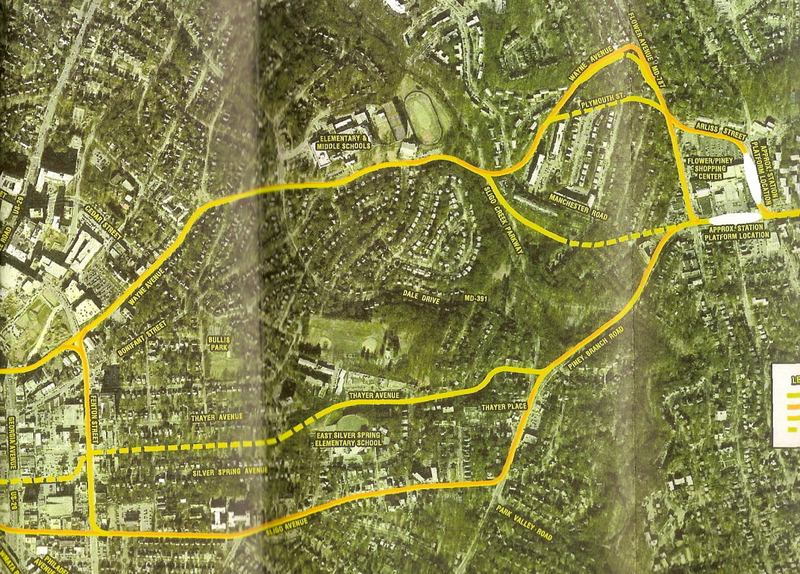 "Everything that I've said, they've come to correct," Leggett continues, noting how his suggestions to have a track in each direction and extend the line to New Carrollton have since been taken up by the State. "That's why I've had a change of opinion." The Purple Line and InterCounty Connector are "light years ahead in terms of the political support" compared to the Beltway, Leggett says. "The public support is for it and there's virtually no opposition for it," as opposed to when the Capital Beltway was proposed and "scores of local politicians" were against it. Nonetheless, there seems to be little in the way of funding. "I am the only elected official who said 'pass the gasoline tax.' They said it was political suicide," Leggett recalls. "The only thing that is going to move these projects along is finance . . . and the Transportation Trust Fund is depleted." 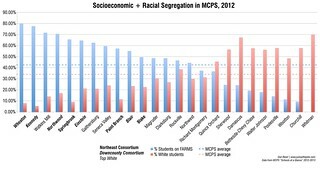 "I don't see it as a Montgomery County problem" anymore, Leggett says. "I see it as the [state or federal] government saying 'let's get the funding.'" The next major hurdle is design, as selecting the route of the Purple Line will have the most substantial effect on the project's price tag and whether it can get federal funding. In Tysons Corner, Virginia officials are struggling over the same issue, deciding whether running the Silver Line in a tunnel would keep it cost-effective. Ike Leggett mentioned a couple of places where the Purple Line would be tunneled, such as near Coquelin Terrace in Chevy Chase or at major intersections such as Connecticut Avenue. 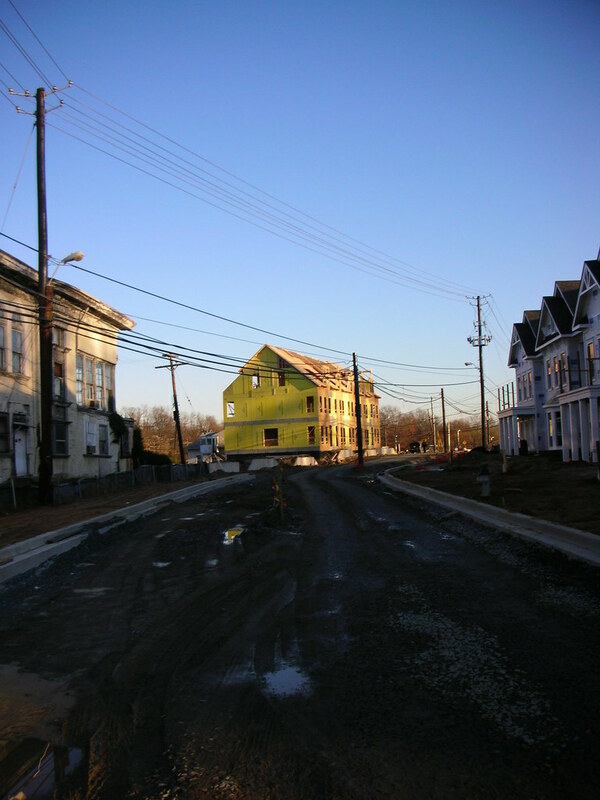 East Silver Spring also came up as a possibility, given the difficulty of the terrain and the neighborhood's opposition to an aboveground route. 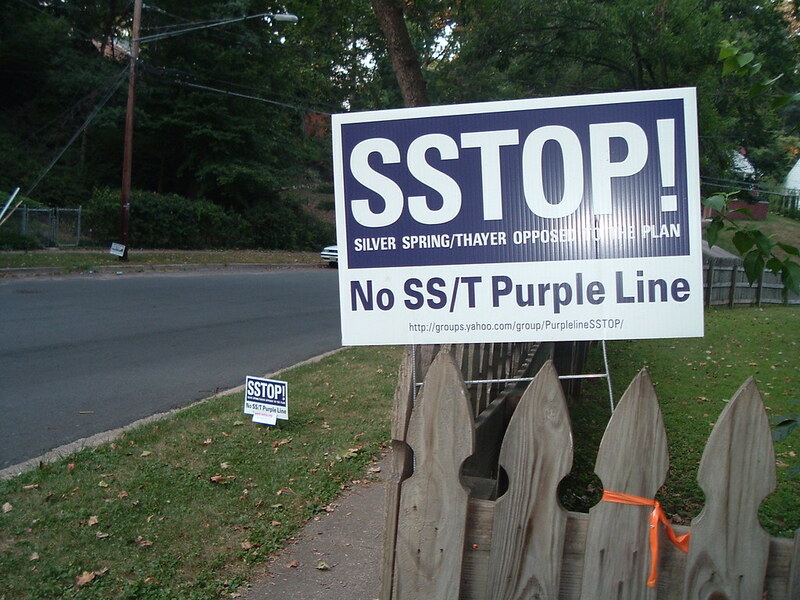 "You've got those steep inclines, you go very close to homes, and it makes it tough to secure this route and ensure the economic development," Leggett says, noting that the revitalization of Long Branch is integral to the Purple Line route through East Silver Spring (A route along Colesville Road and University Boulevard, often mentioned by neighborhood activists but long abandoned by the State, would not stop in Long Branch.) "But you're also adding cost and you have to go through the communities," he adds. If you tunnel, he says, "you run into the Tysons Corner." Ike Leggett is, in fact, a nice guy, nice enough to speak with me and nice enough to suggest that I get my facts straight without, of course, directly saying so. Meeting him was a humbling experience. After eight months of doing Just Up The Pike, I'm beginning to realize that local politics are a lot more complicated than they seemed from the window of a crowded J4 bus on my way to work in Bethesda. But do I have any more faith in him than I did before? I'm not sure. Ike Leggett is every bit as reasonable as he's been made out to be, but he didn't seem to hold much cynicism for groups like the Neighbors. I told him about Where Are The Brakes? and he seemed non-plussed. NeighborsPAC was "very destructive" to our County's ideals, I said. "Why are they destructive?" Ike Leggett responds. After all, they only "added to the margin" of his win. Ike left the door open for you and he (or his office) to have regular communication. This is good. How about an arrow on your photo? You have Ike Leggett's name on there, but I can't figure out which one he is. Must be my bifocals going or something. I've got another photo of Leggett and his teacup, but our friends at Flickr weren't letting it happen last night. 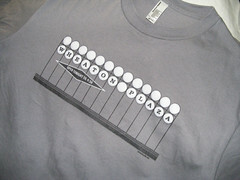 It'll be up later today, along with the stuff on the Purple Line.